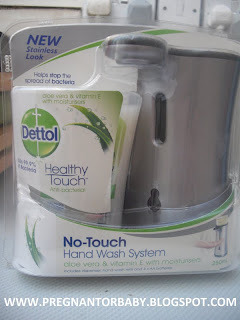 DETTOL No-Touch Hand Wash System helps eliminate the millions of germs that your hands can pick up each day! It automatically senses hands and dispenses just the right amount of soap. Handwashing is one of the most important steps you and your children can take to help you stay away from harmful germs that can cause diseases and with the DETTOL No-Touch Hand Soap System, you and your family will never have to touch a germy soap pump again. It's ideal for use in the kitchen or bathroom. This is a top piece of kit for a family in fact once my mum had seen mine she has now been and brought one as my dad works in a factory and it means she doesn't get his horrid dirty hands on her soap, unfortunately in means she still gets dirty suds on her tap lol. She brought the white one to my dads disgust, so he repeatedly told me how mine would look nice in his house, shame I didn't give in!! (soz dad lol) My son is also impressed with this magic soap dispenser, luckily for me I have it on a shelf he can't reach/play with so he asks to use it when needed! I would recommend this product for a family, for someone who works that gets messy hands, A nursery for the hygiene this would even be fabulous in a doctors. In fact even if you like gadgets you should invest in one as not only is it hygienic for your family it's a bit of stylish fun too.